Joybilee Farm makes the world’s best Goat’s Milk Soap. Our customers tell us that. They say don’t ever, ever change your recipe. Its already the best. You can’t improve on it. This year we did improve on it. We said to ourselves, “Joybilee Farm makes the best goat’s milk soap in the world, so we should package it so that it looks like the best, too. ” We designed a new package. The package is made of paperboard, so its biodegradable. It protects the soap from being contaminated by unwashed hands in the store. Lots of homemade soap has a cigarband type of packaging that leaves soap open to contamination — the world’s best goat’s milk soap needed to be better. People need to be able to touch the soap and smell the soap. Our first packaging was cello bags. No one could smell the soap or touch it. It kept the soap clean. But the packaging was plastic. Plastic feels bad, it smells bad and its bad for the environment. We switched to brown candy bags. So now you could smell the soap and the soap stayed clean. But no one could see the soap or touch it. The new boxes have a window. You can touch the soap, smell the soap and you can see the attention to detail in every bar of Joybilee Farm goat’s milk soap. Every bar is still individually embossed with “Goat’s Milk Soap” or “Hand Made” or our shampoo bar signature — a celtic heart picture. The soap packaging is a detail that makes Joybilee Farm goat’s milk soap the best in the world. But if the soap itself was crap, no fancy packaging could redeem it. But this soap has centuries of traditional soap making behind it and 29 years of experimental tweaking that makes it the best goat’s milk soap in the world. 1. It lasts a long, long time. “I use your soap everyday, and the last bar that I bought a year ago, I just used the last sliver a week ago. Don’t ever change your recipe.” Most soap makers package their soap right after they make it. They don’t let it age. Soap used before the aging process is harsher on your skin, and it readily absorbs water, making the soap bar dissolve quickly. Aging soap for weeks costs space and time. But traditional soap was aged for years before it was sold. The world’s best goat’s milk soap needs to be aged and our soap is aged for a minimum of a month and up to two years before we package it. 2. Its mild, nourishing, and moisturizing for your skin. 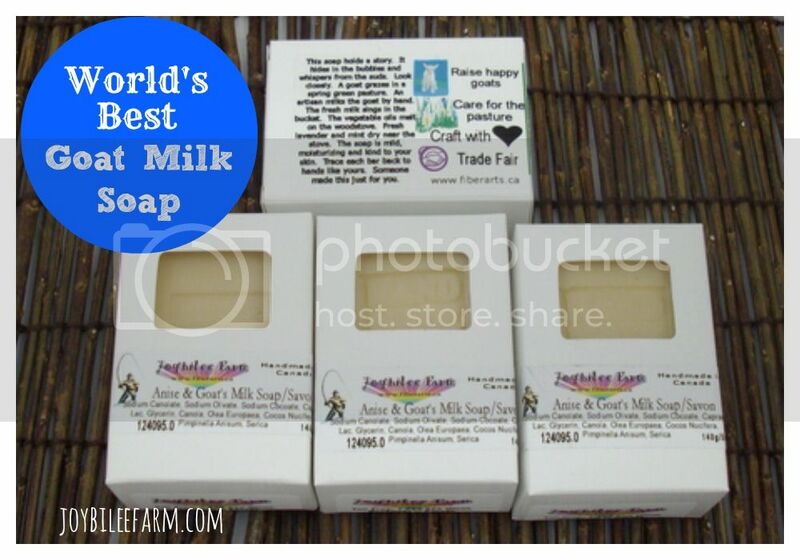 The best goat’s milk soap in the world is mild, nourishing and moisturizing. It has several natural vegetable oils, each adding their own lathering and moisturizing benefits so that the combination is synergisticly better than any single ingredient alone. The milk adds minerals, vitamins, enzymes and protein to your cleansing regime and your skin absorbs the nourishment. 3. It heals your skin. While the cheap soap that you buy at the drug store is detergent based and denatures the protein in your skin, damaging it, the World’s best goat’s milk soap heals with natural vegetable oils, glycerine and essential oils. “My husband had chemo last year. The skin on his hands peeled. Your soap saved his hands.” — Grand Forks. 4. It makes you feel good. “I love the smell and the feel. It just makes me happy, ” our customers tell us. The soap smells fresh — like soap should. It doesn’t have any chemical fragrances. We only use essential oils that contribute to the healing benefits of the soap — like lavender, tea tree, peppermint oil or anise. They add antibacterial, antiviral and skin healing virtues to the World’s best goat’s milk soap. So when you hold a bar of this soap in your hand you can’t help but feel good. Every bar is made with fresh goat’s milk that Robin milks everyday from our small herd of pasture raised Saanen Dairy Goats. The goats are well cared for. Their feed is nonGMO grains that we mix ourselves plus all the grass and browse that they forage while free ranging on our 140 acres. The goats are contented because they have their babies with them all day, while they graze. They feed their young themselves. Lots of dairy animals are robbed of their young shortly after giving birth, so that all their milk is profit. We believe that contented, nurturing mothers produce the richest, best tasting milk. And that babies raised on their mothers milk — on demand — grow into the strongest, healthiest adults with good mothering instincts for the next generation. We trade higher milk production today for a sustainable, longer living herd in the future. When we see our goats smiling their contentment it makes us happy, too. And richer milk from contented, pasture raised goats means a richer, more nourishing bar of soap for you and your skin. 5. The Worlds best goat’s milk soap is good for the environment. Environmental marketing isn’t worth anything if the product is crap or the story isn’t authentic. You can come and visit Joybilee Farm and see our environmental story for yourself. Our soap is cold processed and has a low fuel input. The minimal fuel that we use in soap production is renewable wood fire stoked with deadfalls. The World’s best goat’s milk soap is made in Boundary Country and shipped by post around the world. You can find it in the local stores — Gallery 2 in Grand Forks, Tomorrow’s Treasure in Greenwood, The Boundary Rail Museum in Midway, and Rags, Relics and Rutabagas in Rock Creek. But we don’t sell it wholesale and we don’t ship it to stores all over the world. If you want it you need to pick it up locally or mail order it from Joybilee Farm. We make mail order easy with our online shopping cart. And we’re working on making that part of getting our soap even better…. By limiting the outlets where you can buy the World’s Best Goat’s Milk Soap, we ensure that our carbon foot print is small, that we don’t overgraze our land, and that the herd of goats remains the size that one family can manage without harming ourselves, our animals or our land. Our competitors, many of whom package detergent to look like soap, price their bars well above our prices. Or they sell for less but reduce the size of the bar, so that by weight and cost per use their soap actually ends up costing a lot more. Or they make their soaps with extra water so that the soap dissolves quickly as you use it and you have to buy more soap sooner. We hand cut our bars of soap. The box says its 5 oz. but it can range anywhere from 4.8 ounces to 7 ounces per bar. And it lasts longer than the competition. Bigger bars mean less packaging in the long run — less trips to the store or visits to the online shopping cart. The World’s Best Goat’s Milk Soap is a luxury you can afford. Pick your favourite bar from Milk and Honey, Lavender and Goat’s Milk, Anise and Goat’s Milk, Oats and Honey, and see which one you like best. please tell me how much the price of one goat milk soap.